Danielle Caterina was a feisty, independent young woman who loved life and never let her disease stand in her way. Her dream was to become a fashion designer - she was an amazing artist for her age and loved to dress up and play with clothes. She also loved softball and spending time with her family and friends. 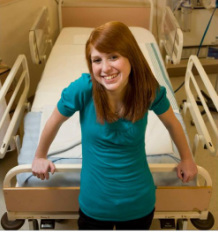 Danielle was born with Cystic Fibrosis - a genetic disease that mainly affects the lungs and digestive system. She struggled her whole life just to breathe, but it never stopped her. She loved to stay active, even going so far as to have her oxygen tank at the ball diamond so she could breathe in between innings and after batting. She was a spokesperson for Cystic Fibrosis and for the Hospital for Sick Children, attending events and making speeches from the time she was very young. In 2006, Danielle's lungs worsened to the point where she had to be placed on the lung transplant waiting list. In February 2007, Danielle was given a second chance at life when she underwent a double lung transplant. She amazed everyone with her speedy recovery and had an amazing summer playing the sport she loved and enjoying the life of the average teenage girl who didn't have to lug around an oxygen tank. But it didn't last. Danielle's body went into full rejection of the new lungs in March 2008, and Danielle was once again placed on the lung transplant waiting list. But time ran out, and Danielle passed away at the Hospital for Sick Children on June 16, 2008. Danielle has had a lasting impact on her friends, family, and her community. Her elementary school, Mother Teresa Separate School in Courtice, Ontario erected a special plaque in her memory, and her high school, Holy Trinity Secondary School recognizes one student each year with a special award in her memory.